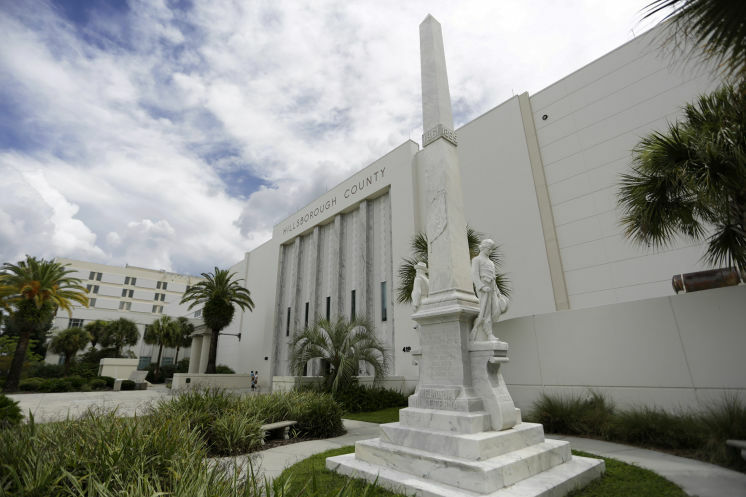 (7/3/2017) --- It is quite shameful that the Hillsborough, Florida County Commission voted 4-3 to preserve a Confederate statue in the grounds of the old courthouse - a monument that is a symbol that not all men all treated equal and from a period of history that individuals of different European heritage owned slaves. The different arguments about how different constituents spoke about how civil rights and how how some of their ancestors were enslaved, didn't faced any of the board that is composed by Victor Crist (1), Ken Hagan (2), Sandy Murman (3) and Stacey White (4), all of them which are at the end of their terms and for re-election by next year, which also new comers such as Angel D'Angelo (5) a new comer who is running also for the County Commission and if you would like to see his points and donate to his campaign you may open the hyperlink. The statue was dedicated in 1911 to honor the Confederate soldiers and sailor, which on a long term with the rise of civil rights and equality the idea of honoring the Confederation in 2017 is extremely outdated as well it just perpetuates the symbols of hate that are still present; some pro-confederate individuals will argue that Is About Heritage, Not About Hate (6) but the heritage from the confederacy is linked to the hatred of African Americans, Aboriginals, Chicano's just to name a few and seeing a pro-confederacy statue in front of a court house ensures that not all men are created equal. If you want more information about the inequality in Florida for African Americans (7) you may click on this link that will redirect you to an editorial from the Tampa Bay Times, where it speaks about the harsher sentences that can be inflicted on someone just by their color of skin or ethnic origin. Not moving the statue is quite an insult to the diversity that is happening around in Tampa, it could be a good idea to even start an educational campaign that generations will keep knowing that honoring racism is bad, even if it sounds silly; but we have to remember that this pseudo-progressive county area has a Confederate flag on one of the busiest highway that also connects to different tourists destinations around Central Florida and brings people from all nationalities and backgrounds to Tampa Bay.